With the season entering the final straight, Everton have launched their end of season awards, with the presentation night scheduled to take place on Thursday 16th May. We are looking at the three main awards, giving our opinion on who should win and who is likely too. Considered the most prestigious of all the awards, the Player of the Season as voted for by the Supporters, promises to be hotly contested with the Blues enjoying a terrific season and Champions League qualification still a possibility. Main contenders include; Leighton Baines, Phil Jagielka, Sylvain Distin, Seamus Coleman, Leon Osman, Steven Pienaar, Kevin Mirallas, Marouane Fellaini and Victor Anichebe. As with any player of the season award, it is often form in the second half of the season that determines the winner. Recent performances normally hold sway over those earlier in the season and primarily for this reason, I think Marouane Fellaini will fall just short in the voting. In the opening months of the season, the Belgium was sensational, winning Everton games and securing at least a point in others. 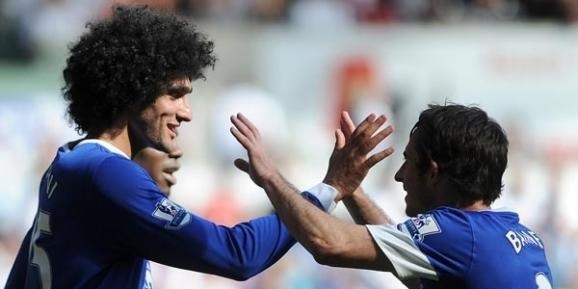 Fellaini’s reputation amongst the supporter base has recently suffered from the media’s endless campaign to engineer a move to Chelsea. This was a contributing factor in Fellaini’s unacceptable reaction in front of the Bullens Road during the FA Cup exit to Wigan, which ultimately ended any hope of winning the award. The other Belgium in the running is Kevin Mirallas. The summer signing is a long shot, especially considering the number of games missed through a niggling hamstring injury. When he has been on the pitch he has been sensational, and his goal against Stoke City exemplified his qualities. His opening 45 minutes against Liverpool was as good as any performance this season, before the aforementioned injury problems struck and interrupted his progress. Centre backs Jagielka and Distin are likely to feature in the voting, however Everton’s defensive frailties and lack of clean sheets should rule both out of genuine contention. Steven Pienaar has continued his fine form since his return from Tottenham in January 2012 and his link up play with Leighton Baines on the left has become the talk of the Premier League. The popular South African will pick up votes, but would probably finish 4th in my reckoning and I fear others will see likewise. Seamus Coleman and Victor Anichebe have both enjoyed their finest seasons in an Everton shirt, with Coleman a real fans favourite due to his endless running down the right of the Everton defence. His recent performances have been excellent and his early season defensive lapses have long since been forgotten. Anichebe has began to realise his qualities and his biggest achievements this season have been to win over a dubious Goodison crowd and displacing Nikica Jelavic as David Moyes’ first choice centre forward. Leon Osman has also enjoyed his best season in an Everton shirt and will be a genuine contender for the award. Finally rewarded with an England Cap, Osman has revelled in a regular role in the centre of midfield, increasing both his influence on matches and his goals return. The final contender and the certain favourite is Leighton Baines. Baines should have won the award last season and has continued in a similar vain, becoming the Premier Leagues best Left Back and gradually replacing Ashley Cole as England’s first choice number three. He has contributed with goals and assists including spectacular strikes in winning performances against Newcastle and West Brom. The goal of the season is a much tighter affair than in previous seasons. Everton have played with style throughout the season and this has resulted in a number of spectacular goals. The winner normally comes from one of two sources, either a truly brilliant goal, main contenders including Pienaar vs Villa or Reading, Baines vs Newcastle, Osman vs Manchester City or Mirallas vs Stoke, alternatively the winner may come from a significant memory, with Jelavic’s strikes against Spurs and Manchester City possible winners. Personally the emotion should be stripped away when making this choice and the winner should therefore be selected from the first category, the brilliant goal. Leighton Baines is one of the favourites for this award. His strike against Newcastle from 35 yards out, flew past the keeper, hit with such power and swerve that Krul in the Newcastle goal stood no chance. Leon Osman’s strike against Manchester City, with his unfavoured left foot, left England keeper, Joe Hart flat footed and with no chance of saving his shot as it bent away from his reach and into the top corner of the City net. Kevin Mirallas’ solo goal typified what the Belgium is all about. Fast, quick, skilful and direct, he powered past the Stoke defence before striking the ball past Begovic. A goal quite unique in Everton’s season and a thoroughly enjoyable moment. Steven Pienaar is a scorer of great goals and has two fantastic strikes to his name this season. In only the second game of the season against Aston Villa, Pienaar completed a brilliant team move with a curled shot past Shay Given in the Villa goal. More recently, Pienaar fired a powerful shot against Reading. Running from just inside the opposition half, he jinked inside before unleashing a venomous shot that left Stuart Taylor in the Reading goal clutching thin air. My vote: 1st Baines vs Newcastle United 2nd Osman vs Manchester City, 3rd Pienaar vs Aston Villa. Expected result: 1st Osman vs Manchester City, 2nd Baines vs Newcastle United, 3rd Mirallas vs Stoke City. The Young Player of the Year award is open to any player, 23 years or younger, who has played for the first team this season. The contenders have all struggled for regular football, with the top three likely to be Oviedo, Barkley and Vellios. The winner is likely to be decided as a result of a popularity contest rather than performance on the pitch. My vote: 1st Barkley, 2nd Oviedo, 3rd Vellios. Expected result: 1st Oviedo, 2nd Barkley, 3rd Vellios.